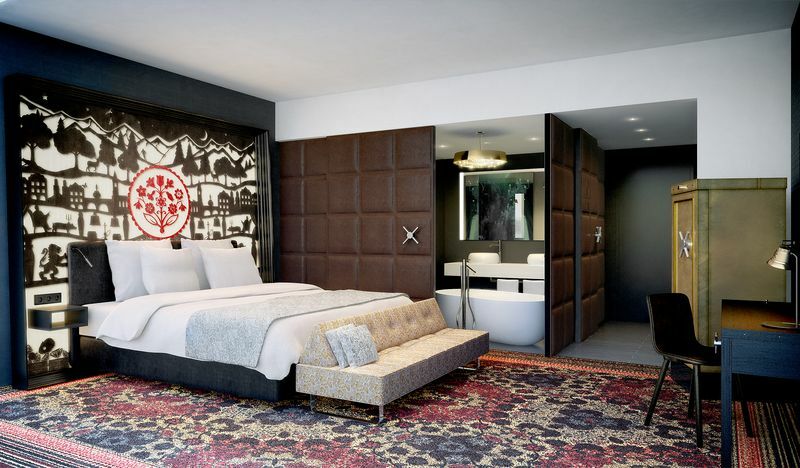 Bethesda, Md., 2015-3-24 — /Travel PR News/ — Autograph Collection, Marriott International’s distinctive portfolio of one-of-a-kind independent hotels, is proud to announce the launch of Kameha Grand Zurich. Set in the heart of one of Europe’s most stylish cities, the distinctively designed 245-room hotel showcases a sophisticated fusion of architecture, unique structure, mixed materials and color that is undeniably signature to Marcel Wanders. Download images. The innovative techniques and playful elements of Wanders’ design concept for the hotel pay homage to Swiss culture. Eleven individually-themed suites include an extravagant Poker Face Suite fitted with roulette tables and Kameha poker cards and a luxurious Serenity Suite appointed with yoga and wellness accessories to foster a sense of tranquility and wellbeing. In addition to the beautifully designed bedrooms and suites, Kameha Grand Zurich features two gourmet restaurants. L’Unico specializes in authentic Italian cuisine, while Yu Nijyo showcases generations of precision and Japanese culinary skill with sushi masters preparing quality dishes that can be tailored to suite guest preferences. Puregold Bar takes its name from the Gold palettes adorning the walls and is a stunning location for daytime meetings and evening cocktails. In the Cigar Lounge, guests can enjoy a selection of Dominican and Cuban cigars, and the Arabian-themedShisha Lounge features a comprehensive range of Arabic Shisha and tobacco. The Kameha Spa offers a menu of treatments and therapies in a peaceful sanctuary setting, with facilities including saunas, a steam room and relaxation beds in both the spa lounge and on the rooftop terrace. Signature treatments are themed after the mountains surrounding the city including an indulgent Mountain Herb Full Body Experience that includes a foot scrub and bath, full body massage with mountain herb oil, and a warm sheet body wrap to encourage the absorption of the treatment’s mountain elixir. Minutes from Zurich International Airport and Zurich Central Station, the hotel has six business suites for business meetings, conferences and celebrations. Conference facilities hold up to 960 people, and feature eight banqueting rooms and The Dome, an architecturally remarkable event area that stretches over 7,500 square feet. Marriott International, Inc. (NASDAQ: MAR) is a leading global lodging company based in Bethesda, Maryland, USA, with more than 4,100 properties in 79 countries and territories and reported revenues of nearly $14 billion in fiscal year 2014. The company operates and franchises hotels and licenses vacation ownership resorts under 18 brands, including: Marriott Hotels, The Ritz-Carlton, JW Marriott, Bulgari, EDITION, Renaissance, Gaylord Hotels, Autograph Collection, AC Hotels by Marriott, Moxy Hotels, Courtyard, Fairfield Inn & Suites, SpringHill Suites, Residence Inn, TownePlace Suites, Protea Hotels, Marriott Executive Apartments and Marriott Vacation Club. Marriott has more than 361,000 people working worldwide at managed or franchised properties and corporate offices. Marriott has been consistently recognized as a top employer and for its superior business ethics. The company also manages the award-winning guest loyalty program, Marriott Rewards® and The Ritz-Carlton Rewards® program, which together surpass 49 million members. For more information or reservations, please visit our website at www.marriott.com, and for the latest company news, visit www.marriottnewscenter.com. This entry was posted in Hospitality, Hotels, Luxury, Travel Services, Travelers and tagged Autograph Collection, Julius Robinson, Kameha Grand Zurich, Marriott International, “Kameha Lake”. Bookmark the permalink.